Reinforcing wire (triangular) profile in accordance with the requirements STB1704-2006, DIN 488, as well as a similar reinforcement wire in accordance with the requirements of TU 14-1-5510-2005 GOST R 52544-2006 (Russia), PN-ISO 6935- 2 (Poland), NS 3576-1, NS EN 10080 (Norway), ONORM V4200 / 7 (Austria), general admission construction supervision № Z-1.2-219.. Reinforcing wire of the round profile having diameters 3,0-5,0 mm is supplied in coils of 1000 kg, diameters 3,0; 4,0 mm may also be supplied in coils having mass 1400 kg. Overall dimensions of a coil having mass 1000 kg: height – 460 mm, internal diameter – 500/420 mm, external diameter – 850/820 mm. Overall dimensions of a coil having mass 1400 kg: height – 650 mm, internal diameter – 5 00 mm, external diameter – 850 mm. 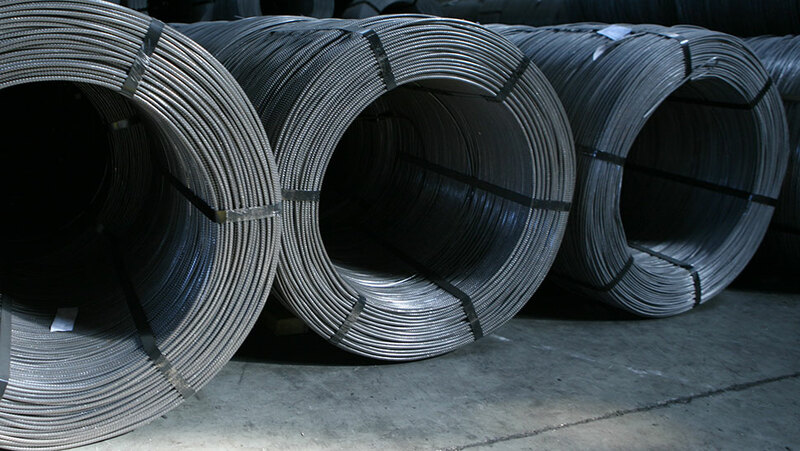 The reinforcing wire of the periodical profile is supplied in coils having mass from 1000 kg to 3000 kg. Mass of a coil is determined according to the customer's demand. Coils are tied with the steel metal strip in at least four places.